Happy Thursday Everyone! Today, I'm going to share with you another book review! 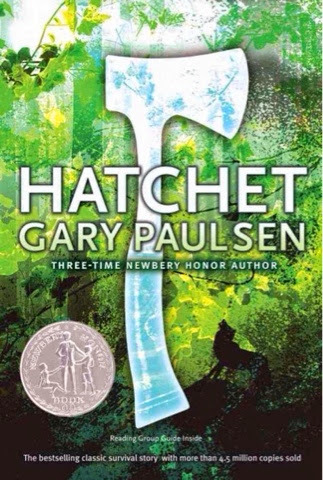 This book is called Hatchet by Gary Paulsen. Gary Paulsen is another fabulous author that I love. 13 year old Brian Robeson is in a pickle. In other words, he's in trouble. Big trouble. Brian is in a life or death situation. He was on his way to see his father in Canada when his single engine plane crashes. He discovers he's in the middle of the wilderness with a Windbreaker and a hatchet. He has to try to find food and water all by himself. Brian isn't only troubled physically, he has some problems emotionally. His parents are divorced and he has been keeping a secret that has been tearing him apart slowly. He will have to control his feelings and use his brain to save himself. Brian Robeson has no one. He has only one hatchet. I thought Hatchet was a really good book. I'm not too crazy about survival stories but this one is actually really good. It is interesting how Brian has this crazy life where at one moment he was given this hatchet as a gift and the next, his pilot dies from a heart attack and he's alone in the Canadian wilderness. I do have to say, the book ended abruptly. (Is that how you spell it?) Hatchet is a great book worth reading. I got my book for $7.00 at Barnes and Nobles. It is time to vote for tomorrow's project! *For your choice, give me an idea in the comments. I will only use the first comment with the "Your Choice Idea" Voting ends Friday the 18th at 9:00 AM, NY time. VOTE IN THE COMMENTS BELOW! !